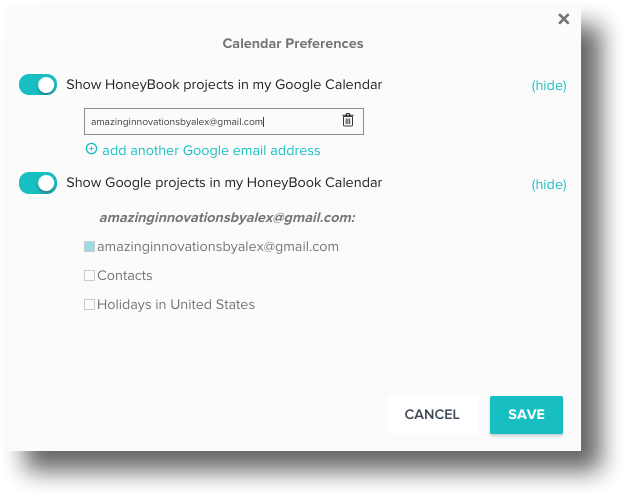 Syncing your Google Calendar to HoneyBook (and you HoneyBook calendar to Google) makes sure that you have all your events in one place. You can read more about what information syncs here! PLEASE NOTE: Currently, direct calendar-syncing is only available with Google Calendar; HoneyBook cannot sync directly with iCal, Outlook, or other calendar tools. However, if you've synced your HoneyBook calendar to Google, and also have your Google account synced with iCal, that should enable you to view HoneyBook events in iCal. 2. Select Calendar from the menu. 3. Click the gear icon in the Calendars section. 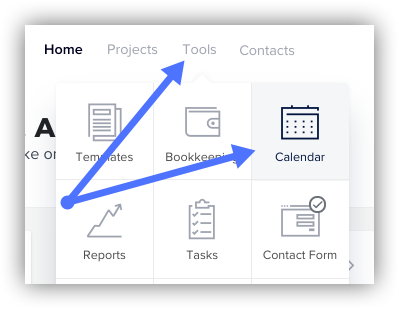 HoneyBook Tip: If you toggle either or both of these options on, you can click Manage to further designate what information syncs. That's it! Your calendars should now start syncing in whichever direction you chose. If you want to make sure your mobile calendar and HoneyBook app sync as well, you'll also need to check that your mobile phone and the HoneyBook app have access to your calendars. In your phone's settings, make sure you've added the Gmail account you need synced (most people already have this set up!). You'll also want to double check in the device's settings for HoneyBook that access to your calendar is toggled on. 1. Launch a web browser on your mobile device or desktop. 3. Sign in, if necessary. 4. Under Shared Calendars, tick the boxes for the calendars you want to see. What does it look like when I sync my personal calendar with HoneyBook?